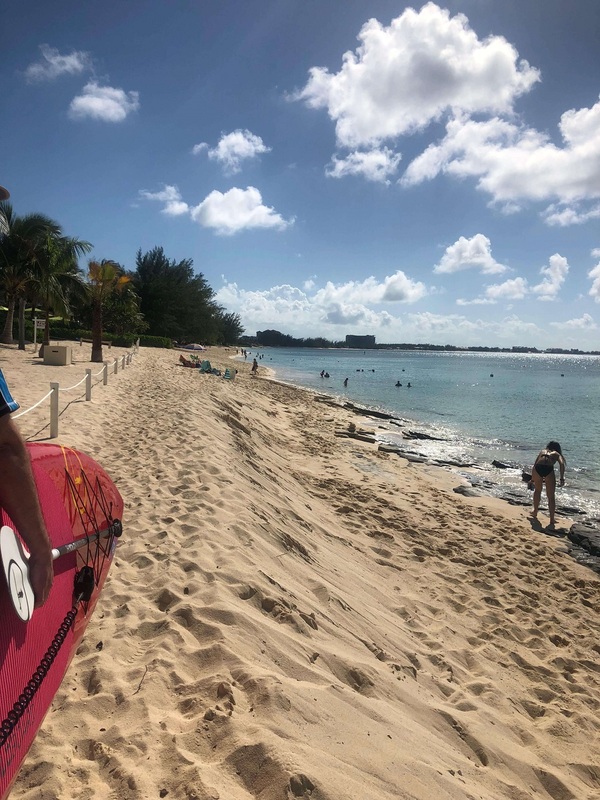 In case you missed the first post in this series, check out Grand Cayman Trip and Tips, Part 1. 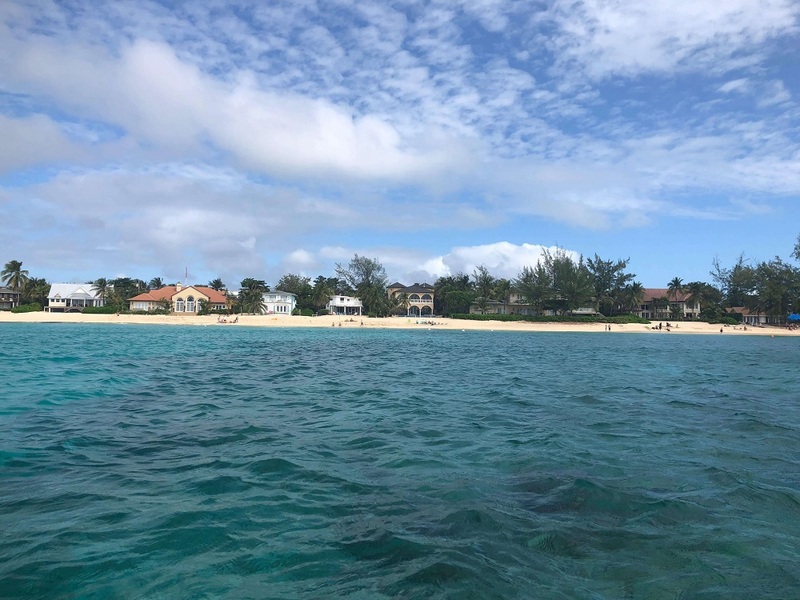 When we were planning our trip to Grand Cayman (after we had already selected the dates) we found a site that listed all the cruise ships coming to Grand Cayman by day. We tallied up the numbers and found that the most crowded days were Tuesday, Wednesday, and Thursday (somewhere around 15,000 people each day arriving on those days). Now we were a good bit north of where the cruise passengers came to shore, but we wanted to avoid all tourist locations those days since we don’t do crowds on vacation. Tip: If you want to avoid cruise ship crowds, it appears that the best days to be out are Friday through Monday. YMMV, so check the calendar I linked to for specifics when you are there. It was overcast in the morning. It turned out to be nothing but we thought going out on a boat or something similar might be wasted today. We had kept many of our plans flexible for just this reason (rain had been predicted for much of the week) — so we could do what we wanted when we wanted. We needed to stock up on food. We got in late last night plus the grocery store was closed yesterday, so we needed supplies. We wanted to explore a bit around our condo, see our beach, and get settled. We were still tired from traveling and simply wanted to relax. So we decided we’d stay close to home today and see what it had to offer. We had all left cold weather (it was in the 40’s for us and my parents had zero for highs a few days) so just being in the warm weather was nice. My wife, daughter, and I walked five minutes to the local grocery store, Foster’s Food Fair, to buy a bunch of food. Grocery stores are closed on Sundays as are liquor stores (I believe). The condo owner had offered to do shopping for us so we’d arrive to a stocked kitchen, but since we were coming in late, we figured we’d be ok. The food is expensive — two to three times what we pay in the US (our house manager warned us about this last night). You can get some decent prices on sale here and there, but even with those it’s expensive. For perspective, we spent in nine days almost what we spend in a month normally. We did carry some snacks with us, but if we go again we may go as far as filling a box with food and checking it on our flight. Our neighbors did that — they even brought in frozen sausage! The grocery store prices are in Cayman dollars. If you pay in US dollars (cash or credit), these already high prices are then divided by the conversion rate of 0.80, so a $50 purchase now becomes $62.50 ($50/0.8). It’s like the reverse lottery — it gets worse, not better. If you pay in American dollars, you get Cayman dollars back. This is ok on day #1, but not as cool on your last day, so plan accordingly. As I mentioned in the last post, pay with a credit card that has no foreign transaction fees. No need to pay 3% more for something already so pricey. Bring your own bags to the store. Otherwise, it’s 5 cents each. Not a big deal but it just seems wrong to pay for something you usually get for free. You tip the baggers (supposedly). I don’t know if this really happens or if they just knew I was a noob, but once when I handed the cashier Cayman money, she asked if I wanted to keep the dollar to tip the bagger. I said I did and I tipped the bagger at the end. They were probably laughing about that for days — thinking of the stupid American who believed you tip the baggers. You can take the cart home. This is actually pretty cool and often eliminates the need for bags. They let you fill the cart and take it to your house. Yes, literally push it home. You unload it at your house and then push it back to the main road. You put it on the side of the road and they pick them up. We made so many trips that we ended up pushing many of our carts back, but a couple times we dropped them off for pickup. Overall I would say the store resembled a mid-to-small-sized independent grocery store in the US. Certainly not a typical grocery store but also not a two-aisle, family place you see here and there in the US. 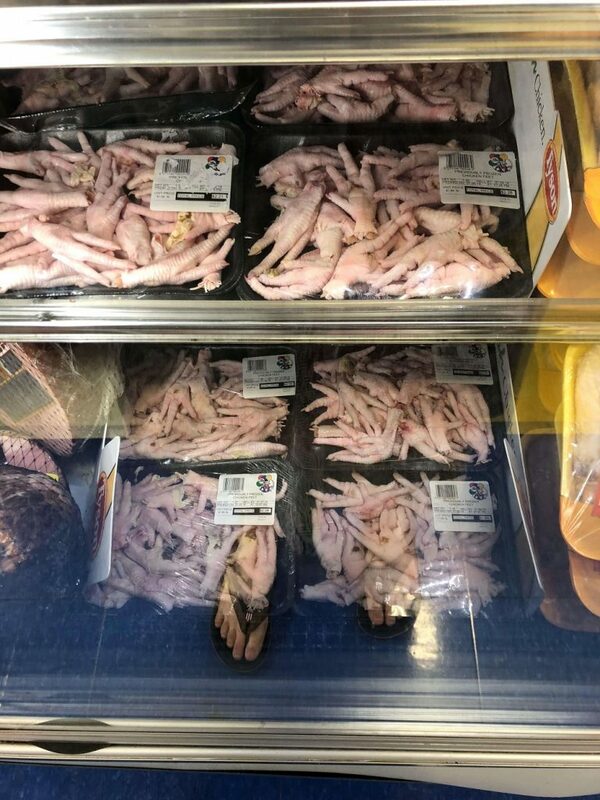 If you’re really interested in what it looked like, do a Google image search for “Foster’s Food Fair Grand Cayman” and you’ll see some pics that show what it looked like. We purchased our stuff for $150 (which would have cost about $50 at home) and pushed it home in a cart. Immediately upon arriving home, my wife realized we’d forgotten a few things (she’s not big on following a list). So my daughter and I headed back to get them, very thankful the store was so close. Once we returned home, my wife and mom started making breakfast. My daughter and I walked a bit on the beach just to see what it was like. It was already beginning to clear and by the time we got back it was sunny. Picture of our beach. That’s me carrying the paddle board. After we ate we decided to make it a beach day. We hit the beach around noon and it was gorgeous! The sun was out, the water was crystal clear, and there were few people on our beach. Perfect! My dad, wife, and I snorkeled Cemetery Beach which was less than a block away from where we entered the beach. 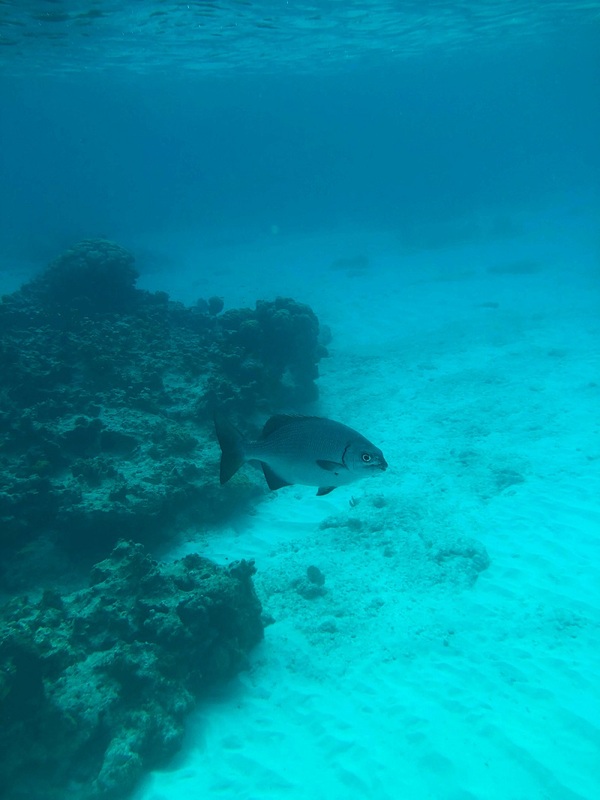 It is some of the best snorkeling in Grand Cayman (4.5 stars on Trip Advisor). If you want to see more details (map and video), check out this post. The video is what it actually looks like under the water (FYI, the last 20 seconds of the video is a bit promotional). Tip: There are spots on Cemetery Beach which have no or low amounts of coral. You have to know where to look! After some time we found a yellow house with arches to the left of the cemetery (if you’re looking from the beach towards the cemetery — away from the water). Swim out straight from there and things are awesome. A picture of our beach from a paddle board. The yellow house marking the “good snorkeling” spot is straight ahead. We snorkeled for two hours while the kids paddle boarded. As I mentioned in the first post, the condo gave us access to four paddle boards for free (versus $50 or more for a few hours down the beach). We did pay for our snorkel gear (masks and fins) but these were a bargain too — $10 each (mask and fins) for the length of our stay. And they were very high quality too. Here’s a friendly fish we swam with just out from our beach. We walked back to our house for lunch, then helped my mom get in from the sun (she had been out too long and was a bit over-heated). The pool at the condo is not heated and was cooler than the ocean, so she took a dip there and felt refreshed. By the time we got home around 5 pm we were all starving (a few hours of swimming and a two-mile walk on sand will do that to you). We had a great pasta dinner that night. We made another trip to the store (why not? ), then spent the evening chatting out on the patio (we came in when it got buggy which is around sunset on the beach and maybe an hour or two later on our patio) and playing cards inside. BTW, for you sports fans, be prepared to go without ESPN. The TV didn’t have it and the app wouldn’t let me stream it outside the US (we did have good wi-fi, but couldn’t access it). So we missed the college football championship, which turned out to be pretty exciting. Since this was our first full day on the island, it’s worth bringing up the water issue. We asked the house manager if we could drink the water and she assured us that the water from the tap and the refrigerator were both fine (they used multiple filters and the water from the island itself was fine). So we drank it. The next day several of us had what I’ll call “bathroom issues.” Not sure if it was something we ate, the water at the restaurant last night, or the water in the house, but we switched to bottled water and were fine after that. BTW, only the adults were impacted. Then again, the kids drank little water. We were up today and it was a bit overcast, but the sun was starting to peek through. Tuesday is the day that had the most cruise ship visitors, so we planned to stay close to home again. It turns out that there are about two sidewalks between West Bay and the Turtle Farm and they last for a cumulative 100 yards. In other words, we were walking on the side of the road, close to traffic, almost the entire way. Then the clouds decided to flee and it became very sunny and hot. We made it to our destination in 40 minutes or so, stopping first at the Cayman Dolphin Discovery across the street from the Turtle Farm. We had no intention of paying a fortune to kiss a dolphin, but they let us go in and watch others do it, which is 90% of the experience anyway. Tip: If you want to do the Dolphin Discovery and the Turtle Farm, do the dolphins first as free admission to the Turtle Farm is included in the dolphin fee. Next we headed over to the Turtle Farm to get info for our group (pricing, hours, features, etc). BTW, we had six people and could never get “group pricing” anywhere — though we tried. We got back to our place, ate lunch, then my daughter and I headed out to the beach. Eventually the rest of the group joined us and we spent the afternoon snorkeling and paddle boarding. After a few hours we walked back to the house and had pizzas we had gotten on sale for $6 US each (three of them, $18, cheap meal). By 5:30 pm or so we headed back to the beach to see the sunset, but the one cloud in the sky followed the sun so it was anti-climactic. We walked the beach until it got buggy again. So we headed back to the house and watched a movie before calling it a night. Today the weather started out not great, just like the other days. It was overcast and windy to start. We had planned to hit the Turtle Farm but wanted to do it when it was sunny out, so we decided to stay home. After all, our condo/beach was so nice, why not? And don’t get me wrong — it was still 75 degrees and nice (especially compared to much of the US that had just faced the bomb cyclone and was now in the deep freeze). As we were sitting on our patio by the pool chatting, our next door friends from Wisconsin told us that there had been an earthquake the previous night near Honduras and that we had been under a tsunami watch for part of the night. Yikes! Good for us that we’re clueless or else we may have panicked. It turned out to be no big deal, of course. In the early afternoon it had both warmed up and was a bit sunny, though the wind was still strong. My wife, daughter, and I got a couple paddle boards and went out for a while but eventually the wind was too strong for us. I was actually afraid my daughter was going to be blown out to sea, so we all came in. While we were fighting the wind and waves, my mom, dad, and son took the bus into George Town, the largest city in Grand Cayman. To call it a “city” is a bit of misnomer, but I’ll save that explanation for later in this series. For now, let’s talk about how easy, cheap, and useful the Grand Cayman bus system is since that’s how they got to George Town. To call them “busses” makes them seem much bigger than they are. They are really vans. They can squeeze in 15 people or so, but that’s very tight. They run on established, color-coded routes. The lime green and yellow lines ran by our place. They run on no set schedule (as far as I could tell), but were ALWAYS on the road. There was never a long wait for one. They work more like taxis than busses. You go out on the route road and stand on the side of the road in the direction you want to go. As the van approaches down the road, it will honk. If you do nothing, it goes on. If you wave your hand/flag it down, they will pull over and pick you up. From there, you can go anywhere between your pickup point and the end of the line (George Town was the end of the line for our busses). The cost is $2 per person Cayman or $2.50 US. You can tell the driver to stop anywhere along the way and he’ll do it. There are no scheduled stops. He also stops to pick up people now and then as long as he has room. Sometimes the driver would drop off someone off the route — as long as it wasn’t that far off. I’ll tell you about our experience with this later in the series. The drive between our place and George Town was about 10 minutes. The busses were so easy and affordable that I don’t see why anyone would need a car. Perhaps if they were going off the beaten path or were staying way out they might, but otherwise the bus could take you just about anywhere. After we got home, we cleaned up and then did a bit of exploring — walking south down the road (my daughter didn’t want to walk the beach) toward Seven Mile Beach. It was a bit better in the sidewalk category going south than it was going north the previous day. We walked about 1.5 miles and there wasn’t really much to see — homes, hotels, beach bars, jet skis and the like for rent, etc. So we turned around and walked back home. My parents and son got home a bit after we did. They had eaten out and we were starving, so a couple of us headed to the store and got some fried chicken from the deli. After we ate we sat outside on the patio and talked, then played cards and watched a movie. Bedtime was around 10:30 pm as it was almost every night. We got so much exercise every day from walking and swimming that we were ready to turn in relatively early. That’s it for this time. To see what happened next, check out part 3 of this series. Ironically, we were on Disney cruise during the college football championship… Despite being at sea, we still could watch it from anywhere on the ship. I guess that’s the convenience when Disney owns ESPN. My only recent non-American grocery store experience is in Ghana. It was actually quite similar to ours, except it was much more crowded and we were paying with Ghanaian money. I don’t remember the conversion rate because it was a couple of years ago now. Looking forward to the up coming posts! Nice post, and look forward to the next one. I tried to look up tipping the grocery store bagger, and suspect they were playing you as I couldn’t find anything. Who knows? It was only $1 so it was worth just telling the story. The below tipping guide only mentions servers at restaurants. The beaches are nice but the video that shows the underwater snorkeling indicates that the reefs are dead and in poor shape. But I’m sure the water temps and visibility was just wonderful! I liked your post, and enjoyed your beautiful pictures! It is always interesting to grocery shop abroad. The small cost for grocery bags has long been in a trend in some European countries I visited, and I believe some American cities are picking up the practice to cut down on plastic. I’m a big fan of paying for plastic bags. Since that was brought in here in Japan, hardly anyone uses the disposable store bags and instead carry their own reusable cloth ones. Your pictures are killing me! We (Mr. & Mrs. FMM) are finally getting married this summer, and we are doing it down in the Caribbean. There isn’t a day that goes by now where she doesn’t send me some type of picture/article that highlights how beautiful it is down there. We haven’t been down there in over 2 years, so we are definitely excited to see those beaches that are similar to those in your pictures! I am happy to see that you and your family are having a great time! It’s very common to tip baggers in Chile, so I’m betting it’s actually a thing on Grand Cayman. Plus, when you think about the peanuts wage they probably make, why not? Your first few days sound awesome! We were in Chile during the bomb cyclone too and that was one of the best parts—knowing we were enjoying beautiful summer weather and not freezing our tuckuses off at home!! As always, enjoy reading your blog! I have to say, those food prices make this destination a little less attractive. I don’t mind overpaying on vacation, but it sounds a little extreme. Hawaii (Big Island, Kauai and Maui) all have decent grocery stores and since we stay over 2 weeks grocery stores are important. Check what chains are available and get their app before you arrive and sign up for discounts, that really helps. Prices are always higher in a vacation spot so mentally prepare. Most small islands have very high food prices because they have to ship in just about everything. If you find out which stores the locals go to you can get the best prices, but be prepared, they’ll be quite a bit higher than in the mainland US. Great stuff John, making me itch to get own there. I have two stand up paddleboards and have been paddling for 7 or 8 years, so along with scuba diving that’s another reason for me to get down there. Went to the Caymans when I was younger with my parents. We did bring food with us and went over the allowed amount and paid a duty, which was still cheaper. Also the Cayman dollar has long been pegged at at that rate…I just multiply the USD x 1.25 to convert (yes 25% higher). The reefs are very important to the locals and the island. Every year there is debate on the cruise ship port. Most cruise ship ports have their bottoms dug out to allow for the large ships to dock directly at the docks. In Cayman the reefs surround the entire island and are important in protecting the island. that’s why the cruise ship passengers have to be ferried in on smaller boats. We use to live there for a few years and were on a work visa. It was the best time of our lives, good food, relaxed lifestyle and the people made you feel like family everywhere you went! My heart breaks (in a good way) when I read your post because I miss it so much! I look for to reading about the rest of your trip! Love reading about holiday. 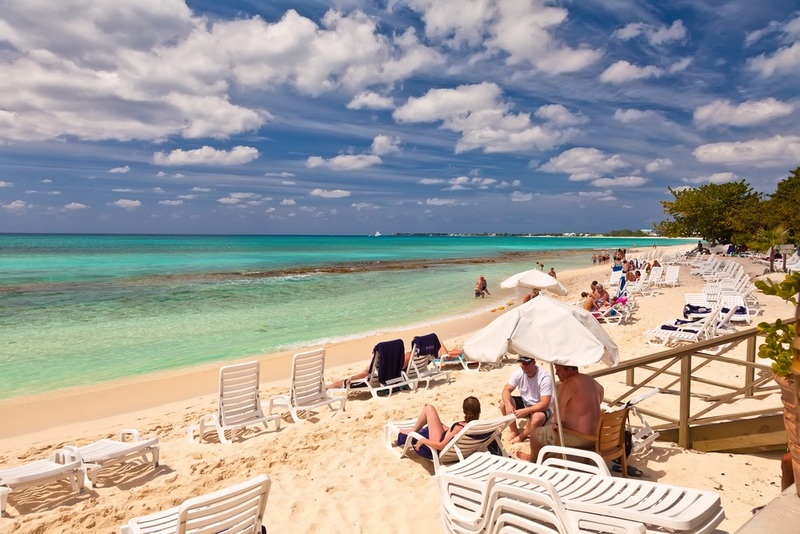 Lived in Grand Cayman 87 & 88 for two years on a work permit helping build one of the resorts on Seven Mile beach. Haven’t been back since. 1) the “boat weenies”, as we called them, who came off the cruise ships in Georgetown. They constantly walked out in front of traffic forgetting about which side of the road the cars drove. 2) the tourist that would rent the little scooters that wouldn’t dare get on a motorcycle back home. Then they would head out with Dad driving and Mom on the back dressed in shorts and flip-flops. Every week you had a few tourist covered in white gauze bandages where they had fallen over in the crushed shells that constituted the shoulder along side the road. Cut and scraped, their feet sometimes looking like hamburger, they would try to salvage the remainder of their holiday in a mix of Bactine and alcohol. It was a educational two years; loved the diving I got to experience and learned a lot about the politics of a very small island. Here in California, we have to pay $0.10 for each plastic bag that we want. Lots of people have started using reusable cloth bags instead. When I was in California for work for three months I bought a Ralph’s bag for maybe a $1 and recouped my cost. Well worth it for the grocery shopping every 4 days as that was I was able to carry. I am not super interested in going outside the USA as I want to see more of it, but you do bring up some good things to think about and keep in mind about travel.